It’s a NASCAR Truck Series playoff event. Racing at the 1.44-mile oval is set to get underway. Ben Rhodes got into the wall during his qualifying lap. The team will have to make repairs and he’ll start tonight’s race at the rear. Brett Moffitt is the winner in round one of NASCAR Truck Series qualifying at Texas Motor Speedway. That’s the track record int eh Truck at Texas. Tomorrow, Stewart Friesen is hoping to head over to The Dirt Track at Charlotte. First, he’s set to qualify as he’s made it to the final round of Texas Qualifying. “We don’t have the dominating speed we had in the Spring. But, we’re close,” Friesen told Fox Sports. Timmy Hill has cooked the corner. He saved it but he didn’t save the lap time. Hill will start 11th. But, he gave it a shot. Todd Gilliland lost it on the exit of turn two. The back end stepped out. He slid up the banking and tagged the outside wall. It caught the rear bumper and whipped the front end into the wall as well. Damage on the front and the rear but it’s light. Johnny Sauter is the last truck on the track in this single car qualifying round. He takes it to the top. Johnny Sauter will start on the pole at Texas Motor Speedway! 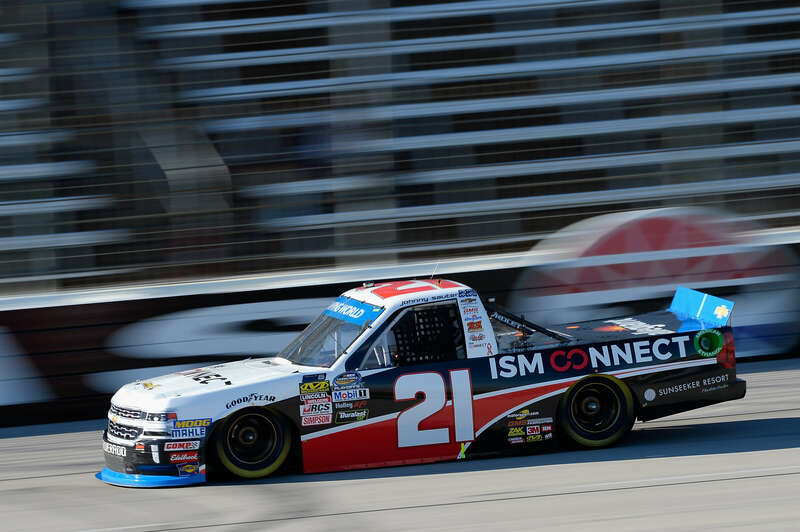 View the 2018 NASCAR Truck Series qualifying results for the NASCAR Truck Race at Texas Motor Speedway below.